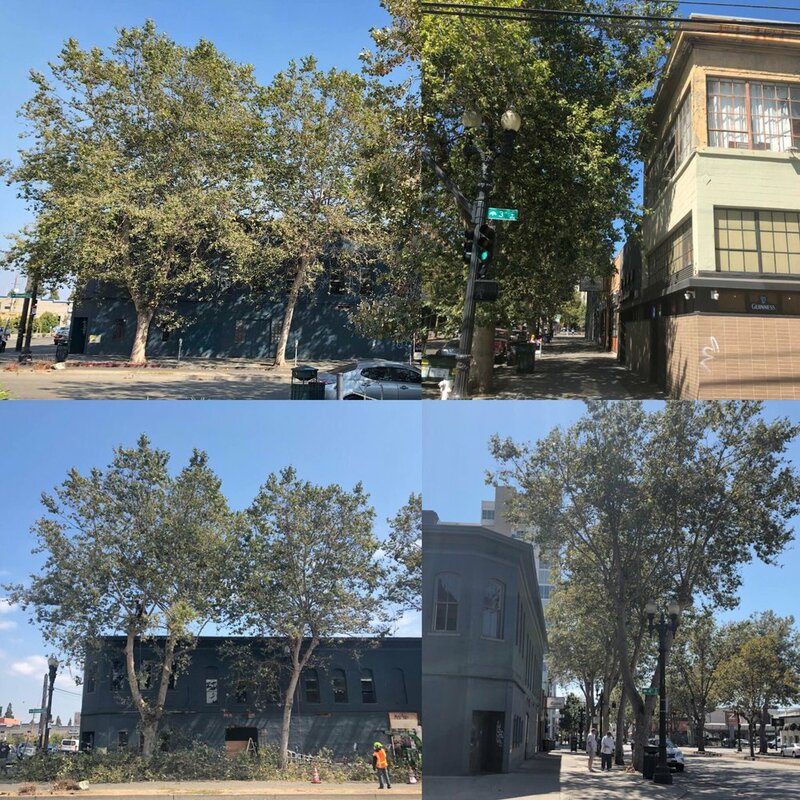 The Jack London Improvement District is working towards a better Broadway that is inviting, vibrant, and safe. Here are current, past, and upcoming projects on Broadway. 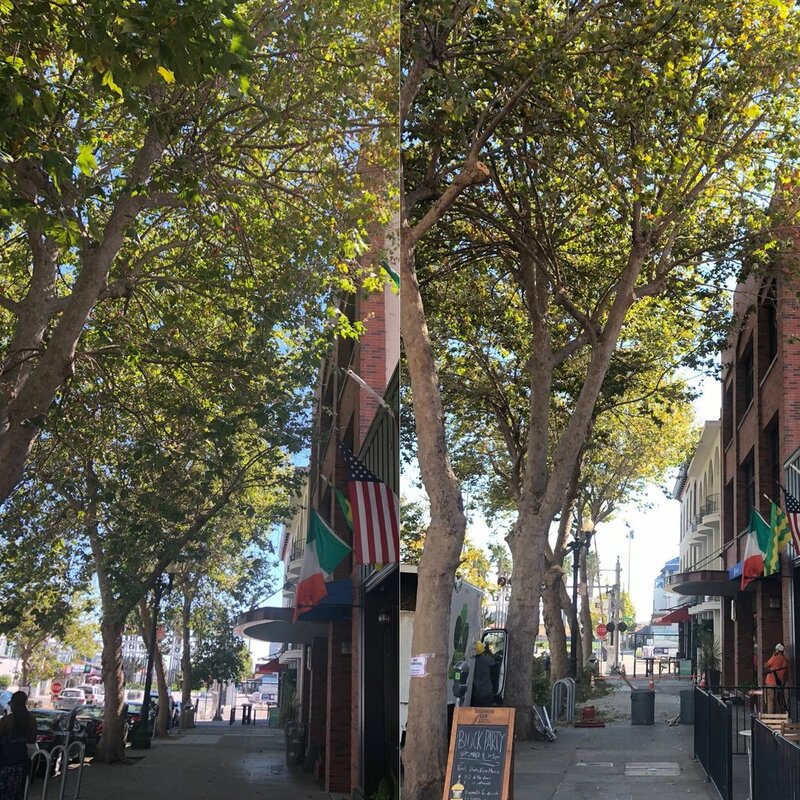 The sycamores on Broadway were due for a much-needed pruning to lift the canopy and let in more light. Some branches were blocking business signs and traffic lights and encroaching upon the sidewalks. The result is a much more open and inviting streetscape. 1) Our Organization. The portion we jump in and fund, install, or execute ourselves. 2) Partnership. The portion of the work that takes building partnership— identifying interested parties, coordinating, reporting, and monitoring progress with the City and other pertinent partners. Partners include the City of Oakland, the Chamber of Commerce and other business organizations and affected property owners. 3) Advocacy. The portion we advocate for. We can use community strength in numbers to expand our advocacy voice. This is where letter-writing and encouraging calls and community maintenance request reports from community volunteers is valuable. 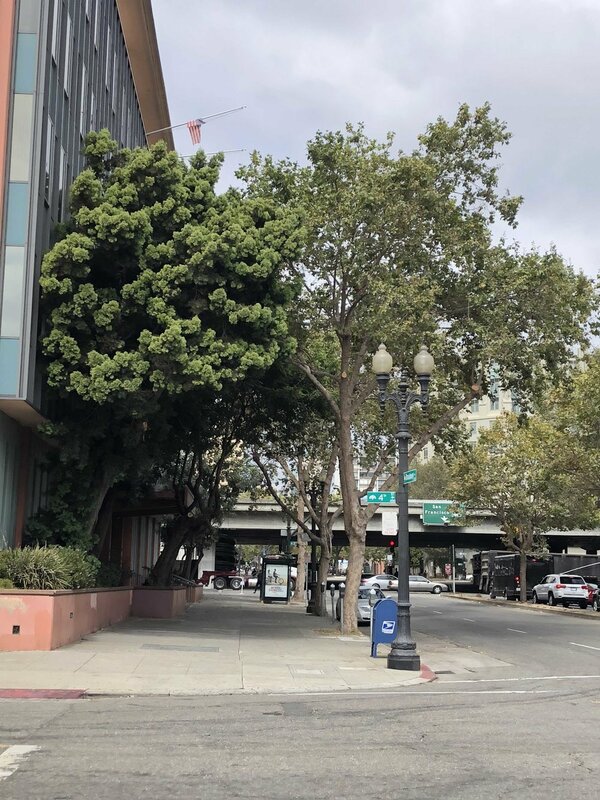 The Oakland Department of Transportation (OakDOT) is proposing traffic safety improvements on Broadway between Embarcadero and 6th Street in Jack London Square as part of a routine pavement rehabilitation project. Currently, Broadway is part of Oakland's High Injury Network, meaning it has a high rate of serious and fatal crashes. These are mostly due to speeding and poor pedestrian visibility. The proposed safety improvements to Broadway include a new all-way stop at 2nd Street, high visibility crosswalks, parking-separated mobility lanes, and pedestrian safety zones. These improvements will make it easier for pedestrians to cross the street, reduce speeding, provide a safe place for people to bike and ride scooters away from the sidewalk, and help prevent traffic crashes. Download the project flyer here. Painted pedestrian safety zones narrow the street crossing and make people walking more visible. They also create space for public art. All crossings will be upgraded with corner extensions and new crosswalk paint. Take the survey and share your thoughts on the project. Underpass improvements: taking leadership participant role in ongoing City and County projects and advocating to improve Jack London underpasses at every opportunity. Median installations & Landscaping Coming soon! The District is currently planning landscaping and installations for our medians. 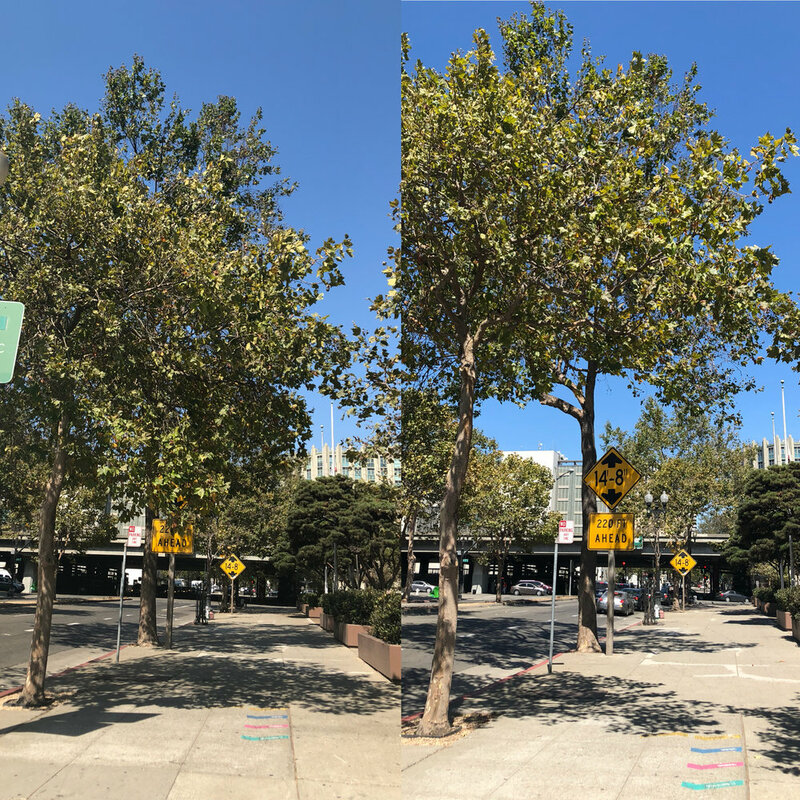 Auto-directional and pedestrian signage installed on Broadway and all District entry points as part of a district-wide signage program to help vehicles and pedestrians navigate to and around the district. We fund and support the free Broadway Shuttle program to improve access and connection between Downtown and Jack London as a service to residents, employers, and visitors. Buses come every 10-15 minutes! Supporting pop-up and temporary uses in under-used or vacant spaces. La Santa Torta food truck @ 333 Broadway starting March, 2019. Art-wrapped utility boxes and murals on Broadway and throughout the District. Our Ambassador team clears Broadway of trash, graffitti and debris daily, and steam pressure washes where and when possible. Let us know what you think. Email info@jacklondonoakland.org to offer your ideas and feedback.